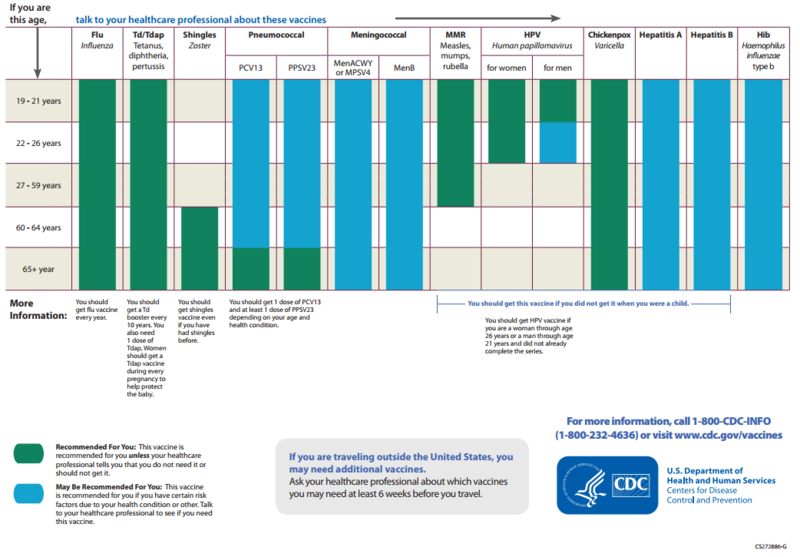 The Centers for Disease Control and Prevention (CDC) provides recommended immunization schedules for adults as well as teens and infants. The above by-age adult schedule can be accessed here. To many adults, especially in the United States, getting a vaccine other than the routine flu shot is uncommon. Over-eighteen vaccinations tend to be on the rarer side. In those one-off cases, people assume you’re getting catch-up shots you missed from childhood—or maybe getting vaccinated before your vacation overseas to higher risk areas (e.g. locations where Zika and Ebola are prevalent). However, many adults do not recognize vaccine regularity. Shots don’t stop at age twelve. Instead, immunizations span your whole life. But many adults are missing out because they just don’t know about it. “I have to get more shots?” you might ask. Well, yes. However, that slight inconvenience is worth a lifetime, one lived infectious disease-free. Vaccines given to young children and infants tend to be of the most critical variety, such as the measles, mumps, rubella vaccine and the polio vaccine. However, some shots like tetanus, diphtheria, pertussis vaccine (Td/Tdap) require repeated doses, or boosters, after a certain period of time. Many people assume that you get your booster as a teen for X vaccine maybe a few years after your first shot, and then you’re done. But according to the CDC, Td boosters, in particular, are required every ten years for the rest of your life. Tdap vaccines are also recommended for pregnant women to help protect their babies. For your health, vaccine concerns must be brought up in your yearly physical exam or with an Ob/Gyn specialist if you are expecting. If you’re over 65 years old, the CDC recommends shingles vaccines if you have contracted shingles in the past and the pneumococcal vaccines PCV13 and PPSV23, which are aimed at strengthening your immune system against the very real threat of pneumonia. Communicating with your doctor about your immunization history and recommended shots down the road is a crucial part of staying healthy and staying immune—at all ages. Even for young adults, it is essential you keep up with vaccines. Undergraduate students, mainly those who live on campus in close proximity with others, need to be immunized for the meningococcal serogroups A, C, W, and Y. Without the MenACWY vaccine, you put yourself and many others at risk of contracting bacterial meningitis, both highly infectious and fatal diseases. College campuses are the perfect setting for disease: lots of young, sweaty people with developing immune systems, all within a very confined region. In fact, we’ve seen meningitis outbreaks at universities before. Some universities have required the vaccine as well as previous immunization records for matriculation. Thankfully, many students have already received MenACWY immunization as a tween or early teen. But a booster is highly recommended after you turn eighteen, and lots of students are not getting that. This, in turn, leads to outbreaks on campuses, like at Princeton University a few years ago, or at San Diego State University where a student passed away, or at the University of Maryland which dealt with 20 cases of meningitis! Ultimately, just take this as your friendly reminder. See your doctor, and talk to him/her about vaccinations. Getting that crucial Tdap or MenACWY vaccine (among others) could save a hospital visit and possibly save your life. For both your safety and your future, planning your shots ahead is in your best interest, even past adolescence.